Once October hits, swap those fall leaves for a spooky Halloween wreath to adorn your front door. These simple-to-make wreath ideas are the perfect way to decorate your home for the scary holiday season. 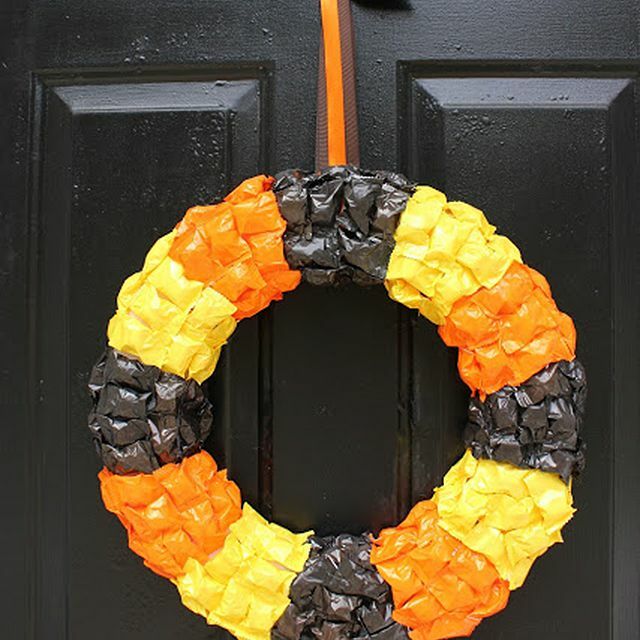 For a less frightful option suitable for younger children try crafting this do it yourself yellow, orange, and black candy wreath which is made out of pieces of candy for your front porch. The Halloween be inspired by The Raven by Edgar Allan Poe and decorate your home with a raven theme, keeping everything black with some feather or black raven paper silhouettes around your home. The feathery texture of this wreath made from inexpensive feather boas is so visually appealing that you will love how it looks against your front door and is a perfect way to complete you raven themed decor. Instead of the typical orange and black color scheme pick more neutral hues to decorate your front porch this fall. This classy DIY mini pumpkin wreath, with white painted pumpkins on a grapevine wreath, will look amazing on your door this fall, and close to Halloween you can add a small sign that says Happy Halloween to customize the wreath for Halloween, allowing you to use the same wreath all fall. If you are looking for an understated Halloween wreath that is the perfect mix of gothic and yet still elegant this simple DIY black ribbon wreath should do just the trick. With just one roll of black ribbon, you can quickly tie pieces of ribbon around the wire frame and can have a Halloween wreath ready to hang in minutes, perfect for all you busy parents. Spray paint your old eucalyptus wreath to create a black wreath for Halloween that can then be enhanced with creepy with glittery orange spiders that will look amazing against the black eucalyptus. For a spooky twist add creepy monster eyes to go around your Halloween wreath that will make it seem like there are hidden creatures lurking within it. Everyone who dares to ring your doorbell this Halloween will be in for a fright when they see your new DIY wreath. Make a bright orange wreath using cut circle pieces of felt to give a soft fluttery wreath which is perfect for fall, and leading up to Halloween you can give it a spooky look by adding a decorative spider accent to complete the look. 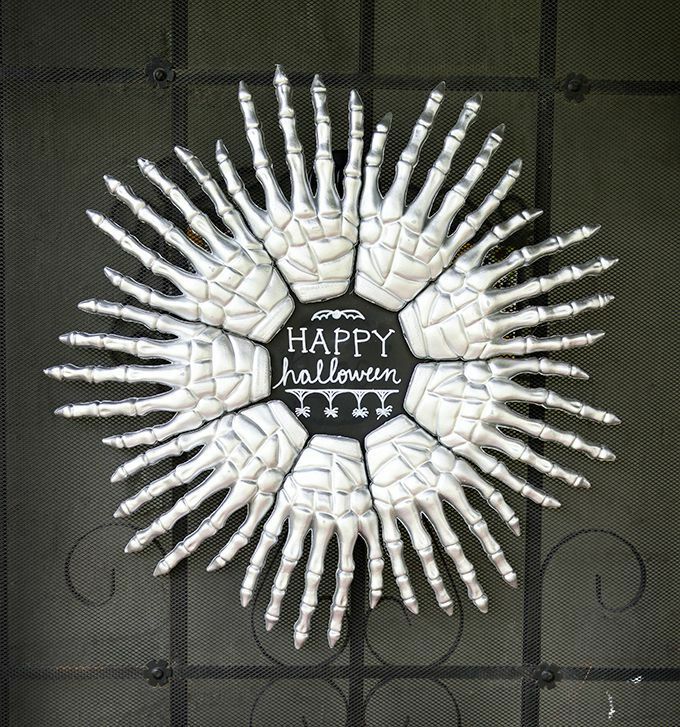 Assemble decorative plastic skeleton hands in a circle around a small blackboard circle to form your own creepy Halloween wreath that will look outstanding on your front door this fall. Add a gothic flair to your front door by decorating it with a black rose wreath that can be made spray paint silk flowers black to create this sophisticated, yet spooky Halloween wreath. Using a standard grapevine wreath temporarily decorate it with woven orange and black ribbons along with a handmade boo banner strung across the middle to create this stylish wreath perfect for Halloween. If you are looking for a more rustic Halloween look this burlap wreath complete with large purple boo sign and spider should do just the trick. This creepy DIY skeleton wreath that warns guests to enter if they dare can help turn your home into a frightening haunted mansion. For a super inexpensive Halloween wreath idea, this DIY Halloween skull wreath is the perfect project to try this fall. Made out of styrofoam mini skulls which can be found at the dollar store, the black glittery wreath will give a spooky first impression to your home when guests ring your doorbell this fall. For the knitters and crocheters out there, use some of your extra wool to create a Halloween wreath for your home by wrapping orange wool around a wreath to give it a new look. Using orange tulle craft a festive spider web wreath that will welcome trick-or-treaters to your home.